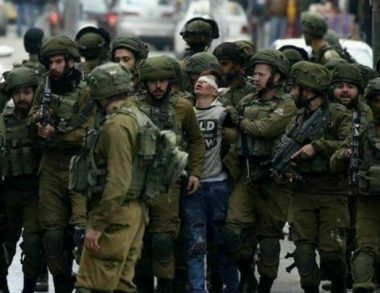 The Palestinian Detainees’ Committee has reported that Israeli soldiers have abducted more than 300 Palestinians in one week, since the American President made his illegal recognition of occupied Jerusalem as the unified capital of Israel, and to move the Consulate from Tel Aviv to the occupied city. The Committee said the detainees have been subject to excessive use of force and violence by the soldiers, in addition to torture and bad treatment during the interrogation and detention. It added that many of the abducted Palestinians suffered injuries, including moderate and serious wounds, prior to their abduction, and some of them were moved to hospitals. Furthermore, the committee stated that most of the abducted Palestinians are children, between the ages of 12 and 17, facing ongoing violations and bad conditions. Most of the abducted Palestinians are from occupied Jerusalem, as the soldiers and police officers have detained 95, including 44 children and three women, while some of them were assaulted with clubs and batons, leading to various injuries. One of the abducted Palestinians is a young woman, identified as Asma’ Wreidat, who was shot in her right leg, and was later moved to Hadassah Medical Center in Jerusalem, where she is also held by the soldiers. Another Palestinian, identified as Mousa Jamil al-Qadamani, from Jerusalem, was shot in his pelvis, and is currently at Shaare Tzedek Medical Center, while Hamed al-Masri, from Salfit, was shot in his face, and was moved to Beilinson Medical Center. In addition, lawyer Hussein Sheikh said all the Palestinians who were moved to Etzion military base, south of Bethlehem, were beaten by the soldiers, leading to various cuts and bruises, and were never provided any sort of medical treatment. Lawyer Luay Ekka, said the soldiers have transferred 48 detained Palestinian children to Ofer prison, near Ramallah, and that most of them were beaten by the arresting soldiers and officers. One of them, identified as Mo’awiya Sufian Mojahed, 17, from Hebron, was kicked and clubbed by the soldiers in his legs, while the soldiers also stomped on his legs, before moving him first to Etzion, where he was forced to stand for several hours. Another detainee, identified as Mahmoud Dababsa, from Hebron, was beaten by the soldiers, especially on his arms and head, and was not provided any medical treatment. It is worth mentioning that Israeli is currently holding captive more than 7000 Palestinians in several prisons, detention and interrogation centers.